They say that curiosity killed the cat, but the threat of mortal peril might not be enough to stave off the curiosity of Chitanda Eru. Most of the time, Eru is an example of proper behavior. She is polite and knowledgeable in traditional customs. She can keep a conversation going and always has a gentle smile on her face. Her every action is proof of her impeccable upbringing, and Eru spares no effort in making her family proud. It comes as a surprise, then, to see how her controlled demeanor falls apart in the face of a mystery. Eru does not usually lack restraint, but curiosity can override any and all her instincts. 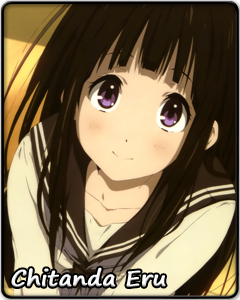 No matter how small or trivial the unknown, when Chitanda Eru wants answers, she will stop at nothing to get them. As her friends and acquaintances well know, she is not above dragging others into her pursuit of the truth. Despite her bouts of passion, Eru is eventually expected to settle down and continue the family tradition of rice farming. As Eru slowly approaches adulthood, she attempts to reconcile who she is with the expectations of those around her. She would not be satisfied with rejecting or sacrificing either of the two, even if finding the proper balance seems like a daunting task. But with her friends there to support her, Eru is sure to find a way.